The whole thing has happened so fast; in October last year the team didn’t even exist on paper but by January ‘05 I had pledges from most of the sponsors, a list of riders wishing to ride for me and the team kit was being made. 2. The build-up to SSMM 24 hour. 3. The second half of Summer racing. Spring was left mainly to each riders discretion although I was very pleased with the way each of them approached this preparation. Lots of training was done and a fair bit of racing. 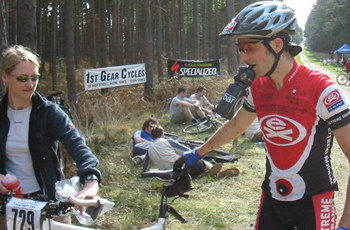 Our main events during this period were the Thetford Winter Enduro Series and the Gorrick Spring Series; some riders also took part in the early season road racing. Richard Wood won three rounds of Thetford (4 hour) and took the overall title; I added to this by finishing on the third step overall. In the Gorrick Series we have won five races (3 x Masters, 1 x Sport, 1 x Elite) I’m the Masters series leader and Richard is second overall in the Elite; the final is in a few weeks time. Gavin Atkins threatened to win several road races during this period and all his hard work finally paid with two wins in a day at Hillingdon in March. All our other riders had at least one podium finish during our Spring Campaign. 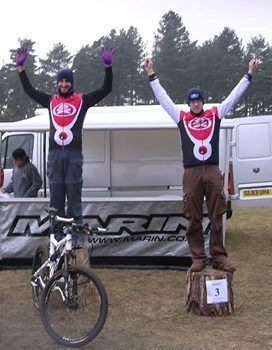 The Main season, and build-up to SSMM, began with the first three big weekends of the season: Premier series and TREK 6-4-2 in Plymouth, a week later by Enduro 6 in Catton Park and then followed by the Gill 100 Enduro Challenge. We split the team to cover these events and riders took their own path through these difficult three weekends. Winning at Thetford in the Winter and Spring is all very well but many expected, or hoped, that our run of good results would start to falter as the big races started. I had every confidence in the team and everyone delivered a top performance on the day. In the Pro 6 hour Richard finished a very credible 2nd behind Nick Craig of the Scott UK team with Anthony in 5th. I won the Open 6 hour and Development rider, James Leavesley, followed closely behind to take 2nd. Another of our Devo-Squad riders, Sally Lee, finished 4th in the 2 hour event. I won’t deny the fact that this event lost it’s appeal, to some of us, with it’s change of venue to Catton. Not really a course worthy of such a highly regarded event; most of my riders chose to take a week off from racing and did the Gill 100 a week later. We did field two riders for the event though: Anthony White finished 4th in the Enthusiasts and Devo-Squad rider, Nigel Lee, equalled his best ever placing of 33rd. Given the course and the low entry fee, even entry on the day is the best part of £20 less than Enduro 6, this must be one of the best Enduro events in the UK. The course was just fantastic; personally I’d have preferred a few less steep hills in the first part of the course but apart from that it really was the best Enduro course I’ve seen in this country so far. In the seven lap (154km – yes, Ultra Marathon distance) Richard Wood put on a display that must surely mark him as a favourite for SSMM 24 hour. He put an end to Jamie Newall’s three year reign at the top of this event, WCPP rider Steven Roach threw in the towel after 5 laps and Rob English, Clic 24 and Bristol 12 Solo winner, conceded 9 minutes. Only three other riders finished the full distance from a starting field of 64. Rich rode to the top spot in 7 hours and 51 minutes, an awesome ride. [Ed: Yes it was a fantastic ride – I was there. A great day for TORQ-fueled riders full stop really. Team TORQ bar’s Simon Turner had a fantastic ride into 3rd place on the 7-lap event (he’s just getting stronger and stronger every year). Team Foska/TORQ bar rider Marcos Schier slam-dunked a commendable 2nd place in the 5-lap event. And last, but by no means least, there’s 16-year-old TORQ-tuned Jay Spetch, who won the 2-lap event – with a sprint finish!! Jay’s making some serious waves in the Youth class this year]. I took on the slightly less daunting (although only 18 riders out of 88 starters finished the full 110km distance) 5 lapper and finished in 3rd. Nigel Lee took 9th in the 4 lap event and Sally won the 2 lap – her second win of the season after taking the Black Park cross-country a week earlier. Well, we are and endurance team, so it’s only fitting that we have 5 riders from the team in the Solo class at SSMM in June. I don’t know how we will do although I have a good idea what we are capable of; I’m looking forward to it. Between then and now we have the second and third rounds of the Premier and TREK 6-4-2 to deal with as well as the Gorrick finals.